In 1984's, the SPARC processor was envisioned with the first release in 1987. It was, and is still considered by scientists to be the premiere RISC processor on the market, with educational books based upon it's research. Some 30 years later, and many pieces of silicon, architects have guided from high clock rate with reduced instruction sets to include various special instruction sets for visualization and block movement. SPARC was originally created by Sun Microsystems, other companies such as Fujitsu also created SPARC processors, and Sun was acquired by Oracle. Oracle appeared to be holding the benchmarks for the fastest processors & systems, in the world, for many years, until Fujitsu's latest release, but Oracle appears to be releasing their next processor: the SPARC M8. In January 2014, Oracle released a processor and operating system road map which indicated a new processor was supposed to arrive around in 2015 with double througput and 1.5x thread performance gains. This seemed fanciful, at the time. Also, at that time, a new processor was projected with throughput increase of 1.3x with a singe thread 1.5x increase. This is really a phenomenal performance increase, considering what has been done so far - but the question is... was it really possible? The Oracle M7 processor, featuring the upgraded S4 core, was announced in Hot Chips 26 on August 12, 2014... Oracle M7 Processor was released in 2015, offering features such as 32 cores and 8 hardware threads per core providing some 256 virtual CPU's. It became, unarguably, the fastest processor on the market, for many years. It performed: at a higher throughput, per socket; higher performance per hardware thread; higher performance per SMP system. It held the spot as performance king for years. The SPARC ecosystem was driven around a specification that multiple vendors could create silicon around. While Oracle continues to drive new silicon, companies like Fujitsu also drive new silicon, with their recent SPARC processor release. Their latest processor is the SPARC64-XII or SPARC64-12. 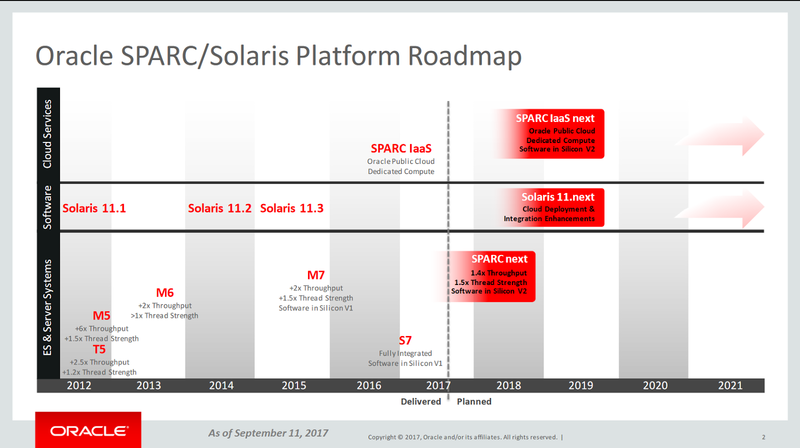 Their latest processors support Solaris, and presumably Linux, since they released Linux on a previous platform and Oracle is supporting Linux on SPARC. It appear to be the fastest processors on the market, possibly faster than Oracle's M7 processor and systems. 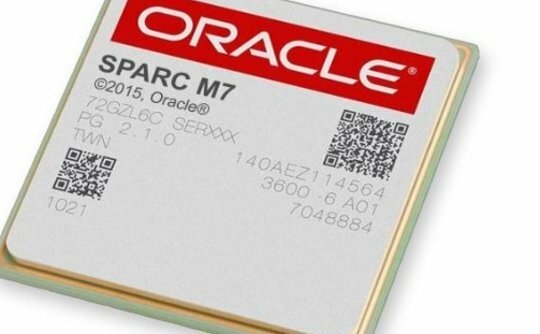 The Oracle SPARC M7 was around for 2 years but it is appearing to be proverbially "long in the tooth." It was originally released in 2015 and 2017 is coming close to an end. Oracle released the S7 processor, reducing the number of cores to create a price-competitive server with Intel & AMD based processors, to push down on the low-end VMWare server environments... but seemed to fail at bundling or licensing the embedded infiniband. 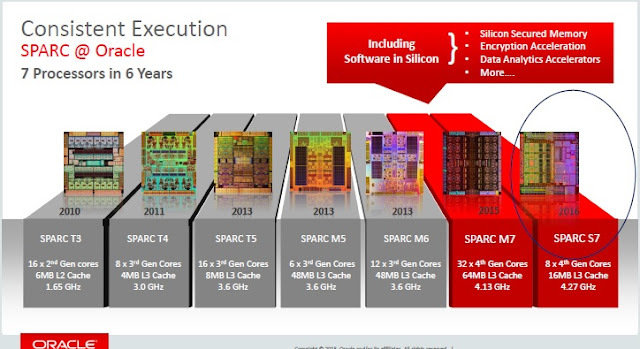 The SPARC M7 and S7 both shared the same CPU Core. Truly, they were both bigger brother and little sister, allowing Oracle to compete in two different spaces. The new High-End space is now experiencing competition... and details are starting to appear about the new M8 in patches to GCC. - Partitioned compare with shifted result. - Unsigned partitioned compare with shifted result. - Partitioned dual-equal compare with shifted result. - Partitioned unsigned range compare with shifted result. The capabilities for the SPARC M8, with the new S5 core, does not appear to be limited to Open Sourced software. Oracle seems to have made available a new Oracle Developer Suite 12.6 beta Program, which also supports the SPARC M8. The University of Texas had been quietly developing enhancements to the Oracle SPARC Cores, for years, with recent work accomplished in 2017. The SPARC M8 processor may arrive soon, featuring a newly engineered S5 core! 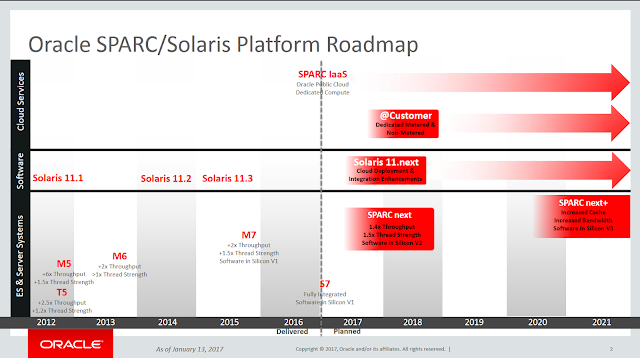 Since Solaris 11.3 was released around the SPARC M7 time frame, one might suggest Solaris 11.4 to be released with the SPARC M8. At the end of 2017Q3, Oracle released a new September 2017 road map. One will notice the missing SPARC Next+. Significant processors, which double is throughput, take close to 3 years to produce... no mention on the road map and non arrow in the road map looks poor. A little more digging shows a pattern. No additional mentions of SPARC after the HotChips 27 2015 symposium suggested embedded infiniband, which never materialized in the Sonoma processor, released by Oracle as SPARC S7. 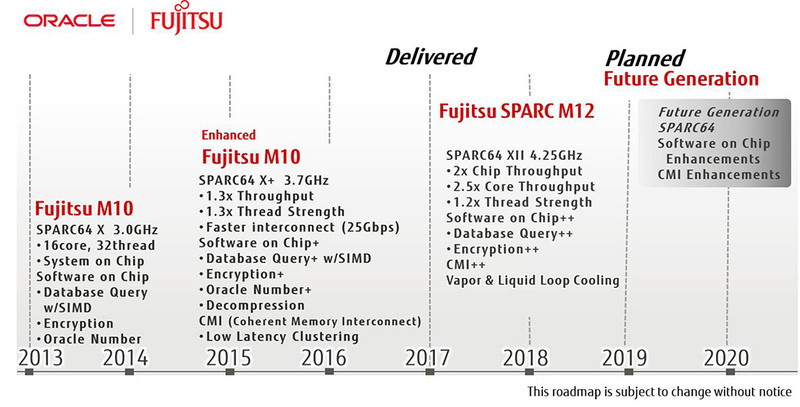 Partner Fujitsu announced ARM to replace SPARC in their next MPP platform in HotChips 28 2016, although Fujitsu hit a 1-2 year "speed-bump" in moving from SPARC. 2016 was a rough year, with Mr. Linux Wim Coekaerts leaving & returning to Oracle. Layoffs announced at Oracle in 2017 Q1 were discouraging, with the announcement of Solaris & Linux development groups merging and Solaris moving to CI. In April 2017, Oracle made a joint announcement of a SPARC emulator in the Oracle Cloud (for 4m & 4u - does not support 4v.) The July 2017 exit of John Fowler from Oracle, who delivered consistency from Sun Microsystems, was deafening... as if he lost a battle in Oracle to Wim. No new mention of the Oracle SPARC M8 processor at the Summer/Fall HotChips 29 2017 event, not the one before. Additional 2017 Q3 Labor Day layoffs hit the wires. 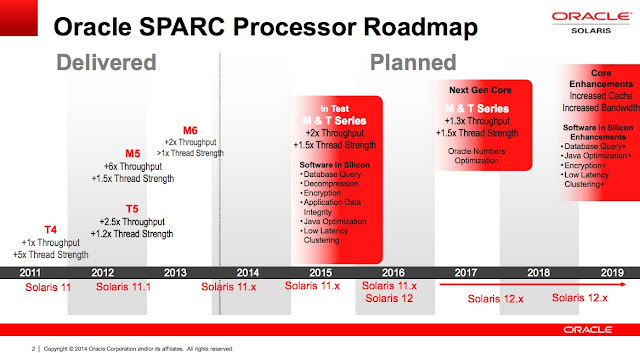 Evaporation of SPARC on the road map after a 2017/2018 timeline release seems to tell the rest of the story. Rumors indicate Linux on SPARC and SPARC M9 had been canceled. Oracle is looking more like a Software Shop, again. In April of 2017, Fujitsu committed to another generation of SPARC, in partnership with Oracle. Since Fujitsu currently has the fastest SPARC processor on the planet, it is beginning to look like it will save SPARC again, with the failure of Sun SPARC ROCK processor, which was probably largely responsible for the failure of Sun Microsystes and resulted with the purchase of Sun by Oracle. Network Management has covered Solaris / SPARC for many years, coming especially from a telecommunications perspective. The SPARC M8, if it is released by Oracle, may spell the final processor in the line from it's creator - Sun Microsystems... some 30 years after the birth of SPARC. Oddly enough, with Wim back at Oracle, SPARC may survive but Solaris may be killed. All hopes are pinned on Asia, for Fujitsu to continue a SPARC a road map, with Oracle providing Solaris 11.next as CI as announced.